Back in my teen days & even when I was a lil kid,I was fascinated with the array of flavors that lip smackers,a brand of fun lip balm from bonne bell has.But alast,I couldn't get my hands on them since duh,I live in Malaysia. So I'd look at them longingly on my mama's huge collection of Archie comics since they were advertised in them the most.I would log on to their cool website & dream to be able to wear some of the fun flavors on my lips.hehe. om buying all of the cute sets!The one that I bought had 2 lip smackers & 1 squeezy lip smackers(like a lip gloss). 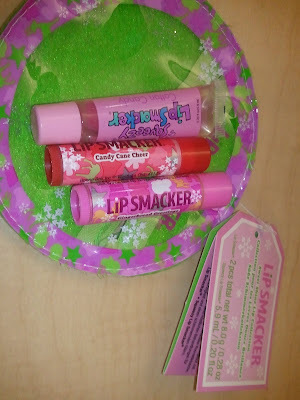 The 2 lip smackers flavor are Gingerbread Grettings & Candy Cane Cheer.The gingerbread smell so yummy!Like a cinnamon toast or a buttered waffle...mmmm..The squeezy flavor was Cotton Candy & it tasted sweet!I love em! Of course,me being me,couldn't not buy other things at the pharmacy.Bought Revlon's Color Stay foundation cos' I'll be going to a few events these upcoming weekends & I don't want to look shiny.Tried it on & it looked great on my skin & plus it's for oily or combination skin(my skin!). Also bought Dove's Intense repair overnight treatment cos' I heard rave reviews about it. 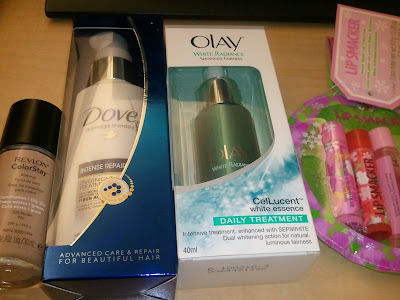 My splurge was the bright turquoise bottle containing Olay white radiance celLucent(not a typo,it's how they spell it & its trademarked) white essence.Bought it cos I have brown spots on my face due to sun damage & hopefully this will lessen it. Cheery lip balm is still my fave!